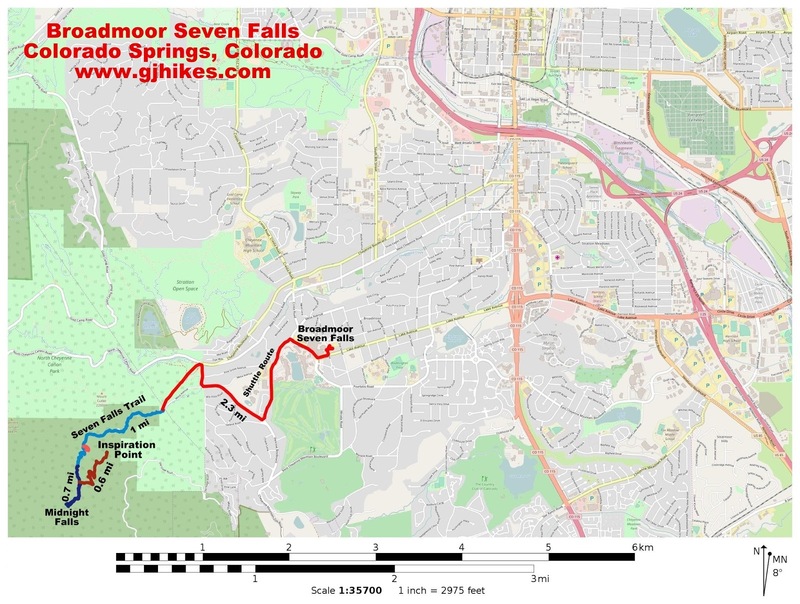 The Broadmoor Seven Falls trail is located in Colorado Springs, Colorado. 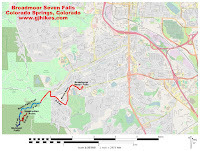 The trail follows a paved path from the Seven Falls entrance that takes it through a scenic canyon to where a 7 waterfalls cascade from one pool to the next as they plunge into the canyon. From there visitors have the option to climb the 224 steps that climb the cliff to the top of the falls for scenic views of the falls and canyon and to gain access to the Midnight Falls and Inspiration Point trails. Other attractions include picnicking along South Cheyenne Creek, several gift shops, an elevator ride up to the Eagle's Nest or dining at the Seven Falls Restaurant 1858. 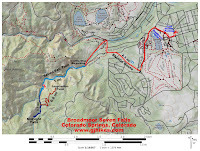 Adventure seekers might also want to check out the Broadmoor Soaring Adventures zipline tour. 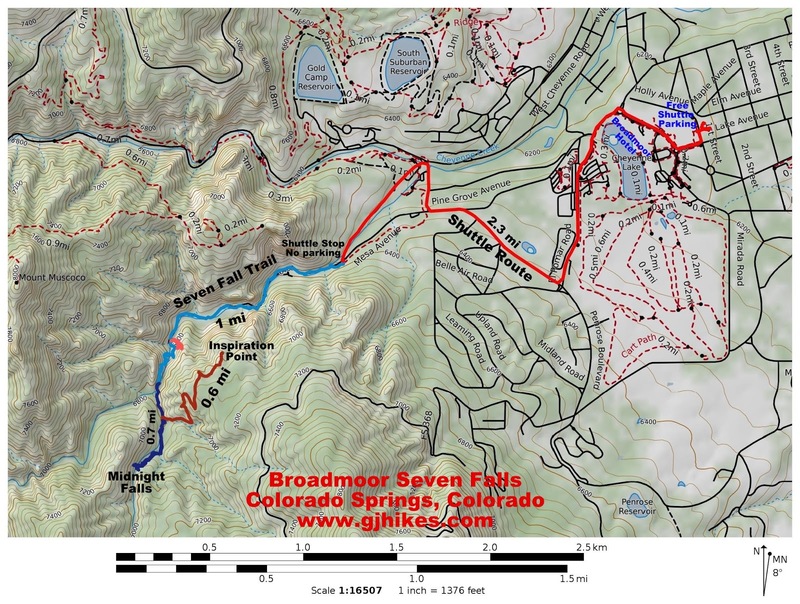 The Broadmoor provides a free shuttle ride from the hotel to Seven Falls. The easiest route to get there is to take Interstate 25 Exit 138 and head west on Lake Avenue for about 1 mile to 1st Street where there is free parking available for anyone going to Seven Falls. The shuttles depart every few minutes so there is usually very little wait time. There is no place to park if you drive all the way to the Seven Falls entrance so the free shuttle is your best option for getting there. After driving the 2.3 miles from the Broadmoor Hotel the shuttle will drop you off at the entrance to Seven Falls. A short trail leads past the entrance gate to the Ticket Depot where you can pay the price of admission. For $2 you can buy a tram ticket that will take you the remaining 1 mile to the falls. If at all possible you will want to forget about that so that you can better enjoy the scenic canyon by walking. The route is lined with wildflowers as it parallels the creek with its cascading pools as it works its way through the Pillars of Hercules and deeper into the canyon. Enroute there are benches, picnic tables, restrooms and a general store. At the end of the road the trail continues past the Seven Falls 1858 Restaurant to the viewing area. The viewing area offers a tranquil setting at the base of the falls where visitors can enjoy the ambiance and perhaps toss some feed to the monster size rainbow trout that swim around in the pool beside the restaurant. For a little more exercise and to get a closer look at each of the 7 waterfalls you will want to climb the 224 steps to the top of the falls. As you climb the stairs you will come to a plaque with the name of the waterfall that it is across from. There stairs level off as they reach the highest waterfall. You can turn around here or continue on up another 100 yards or so to the storm shelter. From there you might choose to take the short hike over to Midnight Falls or continue climbing higher up to Inspiration Point. If you have time, once the shuttle gets you back, you might consider taking a stroll around the Broadmoor. The well manicured grounds provide a pleasant setting for the historic hotel where there are several more restaurants, shops, and a free antique auto museum. Seven Falls, like the Garden of the Gods, is one of the must visit places in the Colorado Springs area. Unlike the Garden of the Gods it does cost a little money for admission. The splendid beauty of the falls and the variety of activities that are available make it a great place to spend the day. If you would like to see it for yourself then all you have to do is 'Take a hike'.